Traditional photography is, and always has been, a fairly intimate experience. Yes, there are photo-sharing apps that let you comment, like, and “heart” your friends’ snapshots, but the actual act of taking a photo is still very much personal. Synthetic, the team that brought us the photo apps Hipstamatic and Incredibooth, wants to change that. Launching this Thursday, the company’s new Disposable Series iOS app — or D-Series, as it’s called — is a free program that hearkens back to the days of disposable cameras. It shuns the instant, real-time focus of today’s digital world, delivering your photos only when a virtual roll of film is completed. Think of it as passing a disposable camera around with a group of friends, only in app form. After you or a friend create a new D-cam, you can invite Facebook friends to share the camera with you. Just like a disposable camera, you’ve got a 24-image roll to begin with. When one person takes a shot, everyone’s photo count ticks down. And (gasp!) you can’t see any of the images until the roll is finished. At that point, you get a push notification and the completed roll is delivered to the entire group that was using the virtual camera, viewed in-app as a chronological album. The images are also added to your iPhone camera roll. From there, you can share them on Twitter, Instagram, or another social destination of your choosing, and then start a new roll. Once Apple’s top App of the Year (in 2010), Hipstamatic has seen its filter-filled territory encroached upon by numerous other apps in the years since it launched. Most notable is Instagram, which boasts over 13 million users and was recently named Apple’s 2011 iPhone app of the year. The recent relaunch of Path brings another challenger to the space, combining filtered photos with an action-filled timeline for a photographic experience that melds memories with friends. Unlike the new D-Series, all of these services are instantaneous, showing your life to your friends and followers the moment you hit send. As nice as Buick’s thoughts seem, is the public really going to want to wait to see the photos they snapped, or have to waste the last few shots just to check out the rest of the roll? Like the app Color that debuted to critical boos from the masses in March, Buick sees D-Series being a great tool at concerts, weddings and other social events. Synthetic thinks it won’t mimic where Color went wrong by making their photo albums private to a group of friends of your choosing, rather than public. In the future the company plans to gamify their disposable cameras. Perhaps you’ll find and unlock a particular camera based on a location you visit, or maybe you’ll get one that’s available for a certain fixed period of time (like a 12-hour festival, for instance). And since you can’t see the photos until the roll is done, you’re free to snap-snap-snap without taking time out of the experience to edit and post on social media sites. 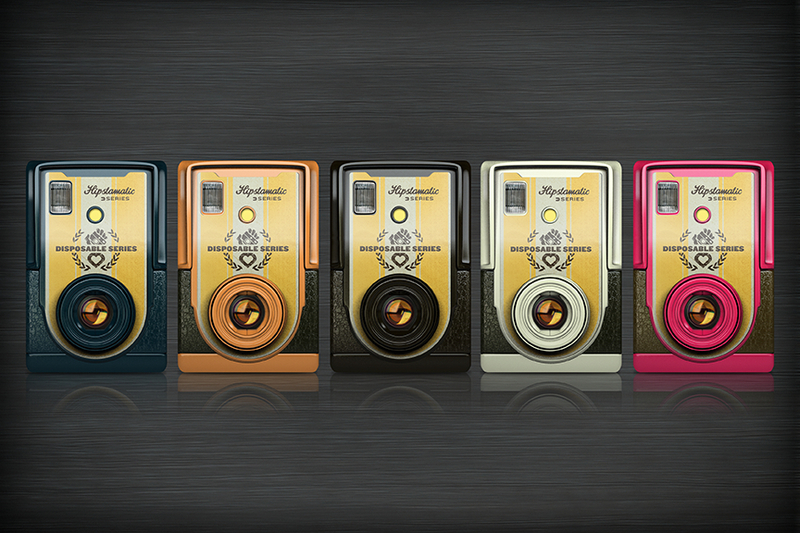 D-Series includes one camera (with one filter style), but there are three more you can purchase in-app for $1 apiece. You need to download the free app to share a roll with friends, but if one of them has purchased an in-app camera that you don’t have and wants to share the roll with you, you get to check out and get photos from that camera’s roll for free. So if you’re clever, you could team up with a group of friends, each buy one camera, and share them freely amongst yourselves. What’s next for Hipstamatic? Buick is constantly dreaming up further ways Synthetic apps like D-Series could be used to inspire and share moments. “I’d love for our engineers to create a camera that would take 365 days to develop, and at the end you could put on this epic gallery show,” Buick said.